If we go for pocket prints, we could get them embroidered instead which apparently only costs a couple quid. If we want a large print on the back or something else, it might be more. My brother is gonna check the prices for hoodies but it looks like we can probably sort it. Perfect! I'm up for a hoodie... Embroided will last longer. Wow. Not sure about the giant meeple. It kinda looms... ? You're right, the one with the crown is unbelievably awful. But it gave me a giggle so it was definitely worth knocking up . Embroidered would be great. Isn't the design a little detailed for that though? I wouldn't have thought you could sew that small. Yeah, making it silver kinda highlights the other colours more. You can get incredibly detailed embroidery. Technology these days. If it's too complex, we can look at printing or perhaps simplify the design. If they can do it like that then fine! Otherwise, I guess you could simplify to have one meeple, one die etc in each quadrant. I'd go with simpler embroidery over more detailed printing anyway. If that's the choice. I'll work out costs and probably then collect money for those that want them. What sort of price would people expect to pay? You could zoom in on the quadrant designs... For the embroidery. Perhaps showing 3 or 4 dice/cards/hexes/meeples. The embroidery will last longer. I was just thinking it might be nice to see something that took inspiration from that, even if it didn't get chosen. Having a mega meeple head with a meeple on top might be a good alternative for the helmet with the lion on top. allegary wrote: I realise I am late to the party here with the poll ongoing but I thought I should point out that this is the coat of arms of the city. We could use two of the more "special" designs from the German wizard cards for the two dudes either side. You have a copyright issue if you want to take artwork from a game directly. 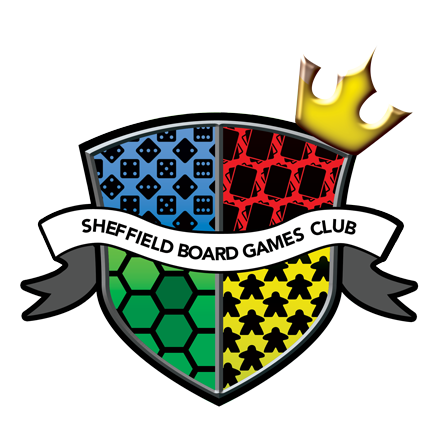 I don't really wanna rethink the whole thing to model it after the Sheffield Arms, if anyone else wants to have a go, fine by me. Kes wrote: You have a copyright issue if you want to take artwork from a game directly. Aha, I played it one time but don't remember the pictures. Kes wrote: Aha, I played it one time but don't remember the pictures. They're scarred on my mind. I was distracted by how it's just a re-skinned playing cards game. I'd definitely pay a little more for it to be embroidered! Nice work Kes. I've been trying to coax my other half in to making a waterproof gaming back, could make a line in club bags! Oh and a t-shirt for me please! 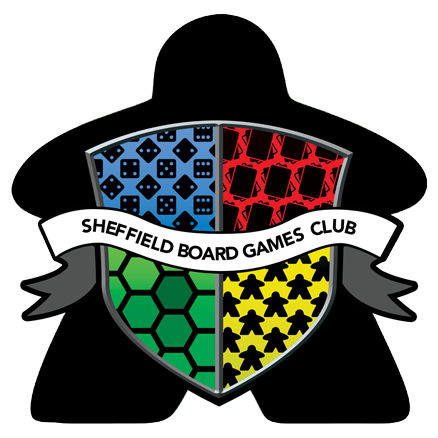 Good grief, I've lived in sheffield over 20 years and never seen that awful official city coat of arms. I prefere Kes's. Laura suggested getting some drawstring bags made up as well, for gaming bits. Might leave that until later but basically we can put it on whatever we want. Who will get the first tattoo? We're looking at 15 for a tee and 25 for hoodies. Should be able to do two-tone tees as well. Hi Kes, are there any thoughts on doing another run on these before the Expo next month?